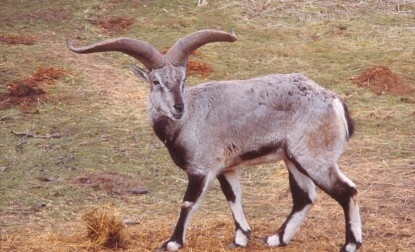 Today I want to write about an animal that has amazing horns, the bharal. These medium-sized sheep can grow up to 165 cm long and 91 cm tall at the shoulder. They can also weigh up to 75 kg. They are also known as the blue sheep due to their blue-grey coat which camouflages them in the mountains where they live, helping them to hide from snow leopards, leopards and wolves. Bharals have very strange horns that grow up, then out to the side before pointing backwards. The males have longer horns than females and they can grow up to 80 cm long. They are excellent climbers and eat moss, lichen, plants and grass that they find in the mountains. Bharals are found in small groups of up to 20 animals in the very high mountains of Bhutan, China, India, Nepal and Pakistan. Are there any other interesting facts that you would like to share about bharals?